When I was in fourth grade, we had to do a presentation about our family and it’s culture, so I called my ultra-Greek grandfather in Florida to interviewed him about our family. It turns out my great grandfather was a real personality, but Bessy, my great grandmother, was not a woman to mess with. As a two young teens, he got her pregnant in Greece, then left to America with his brothers. Well, Bessy wasn’t having this, no way was she going to be unwed and pregnant on the Isles, so she hopped a boat to America to follow him. Needless to say, love really bloomed when Bessy arrived to the States and probably let great grandpa know how it was going to be. They got married, opened various businesses had continued to have children. For a period of time, they owned a furniture store, and great grandpa made (and sold, I’m sure) liquor in the basement. One night something went chemically askew and the furniture store blew up. My grandpa, over the phone, told me this story as I wrote frantically to get all the details accurate. “Don’t put that in the report, huh?” He said. But I knew better – this was pure gold. “Ok, grandpa, no problem.” What could it hurt to entertain people a little?! After I made my poster and pasted on family photos with a huge (handmade) Greek flag, I convinced my mom to make Spanikopita to serve with my presentation. They were so delicious I probably ate 10 that morning and due to over consumption, I could hardly finish my presentation because I was so nauseous. Some things you have to learn the hard way. Spanikopita is served (usually in the shape of little triangles) at lunch and dinner, for celebrations and ho-hum daily meals. It’s an appetizer or a side dish. I even enjoy it for breakfast, but now with portion control. 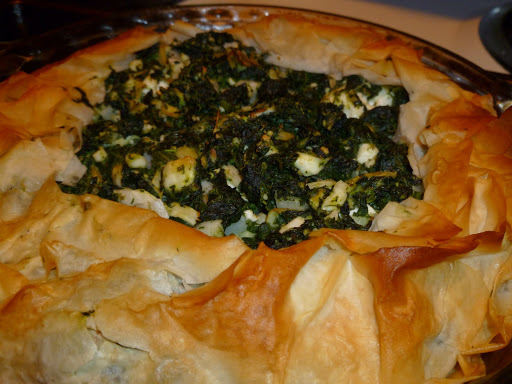 It’s nice to make this as a pie because you use less filo (making it healthier and less work) and more spinach filling, so it’s not as rich. Filo dough is found in the freezer section of the grocery store. Put the filo and the spinach in the fridge to thaw a day or so before you begin this dish. I think it’s the path of least resistance. 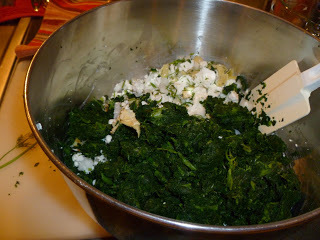 Preheat oven to 375*, using the dish towel you don’t care about – wring out the thawed spinach in batches, to remove liquid. Crumble feta with your fingers, and combine with spinach in a large mixing bowl. 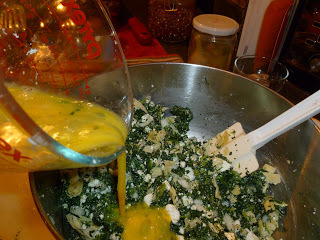 Add artichoke hearts, chives, dill, eggs, salt & pepper, and mix well. Lightly dampen a clean dish towel and unroll the filo dough. Place the fragile sheets on the towel and roll to keep filo moist. Melt butter, lightly grease a 9″ pie dish using a pastry brush. Lay a piece of the filo over the pie dish, lightly encouraging it into the corners and up over the sides of the dish, brush liberally with butter; continue in this way, laying the filo sheets down at alternating angles so the sides are covered and filo is hanging off like pie dough. Put filling into filo covered dish and crinkle the edges of the filo around the spinach filling. Brush filo with butter and lightly wet the filo edges so it doesn’t burn in the oven. Bake on a cookie sheet for 45 minutes, or until filo is crispy and golden brown.